Pictured (clockwise from left) are Danielle Bannister (Marie), Katie Glessner (Cecile), Tyler Johnstone (O'Shaughnessy), Sonia Vazquez (Mme. Carone), Dakota Wing ("Dutchy"), Cory Burns (Jean-Francois Millet), Mark Durbin ("Chicago"), Eric Sanders (Bastien), Stage Manager Kenny Shackford, Christine West (Mme. Bathilde), and Brian Ross ("Papa" Laroux). Not pictured is Jakob Sutton (Thorpe). 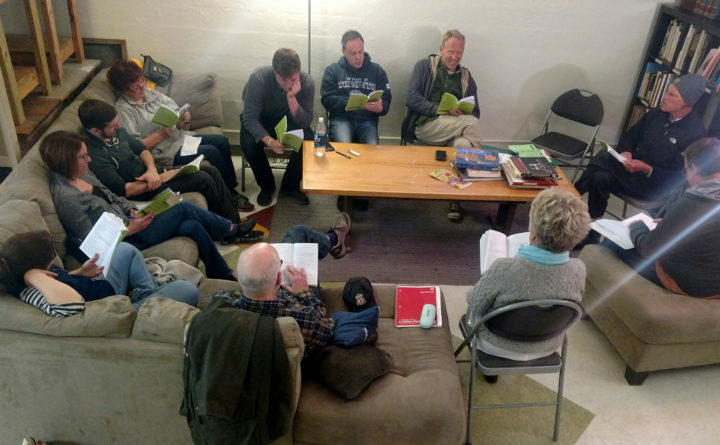 BELFAST — The cast of Belfast Maskers’ production of “Is He Dead?,” a comedy penned by Mark Twain and adapted by David Ives, gathered for an early read-through of the script at Waterfall Arts in Belfast. Directed by Erik Perkins, Twain’s hilarious farce concerns the fate of brilliant French painter Jean Francois Millet. Deep in debt and unable to sell his masterpieces (due to the unfortunate condition of being alive) he and his madcap friends hatch a desperate plan. The production crew will include producer Carol Samuels, set designer Gary Hinte, sound designer Jay Rosenberg, costumers Erica-Rubin Irish and Maya Critchfield, and properties mistress Heather Shackford-Young.